More than two years of practical experience with robot scrubber/dryers has led to a new revolutionary and robust cleaning robot. Using state of the art technologies, at least 25 percent more productivity is achieved, allowing locations to be cleaned more effectively. Better navigation : New laser technology refines navigation and makes the machine suitable for spaces up to 60 meters wide. By adjusting the height of the sonar sensors, the navigation can be adapted to specific locations such as supermarkets, hospitals or warehouses. Better performance : The Taski has a Robust design and well-known and smart software IntelliFlow and IntelliDose. These dosage systems provide the right amount and concentration of cleaning solution tailored to speed and nature and degree of contamination. This significantly reduces chemical and water consumption. Together with the powerful batteries, this allows up to 4 hours of autonomous cleaning! The safety system is double so that at all times the safety is guaranteed. 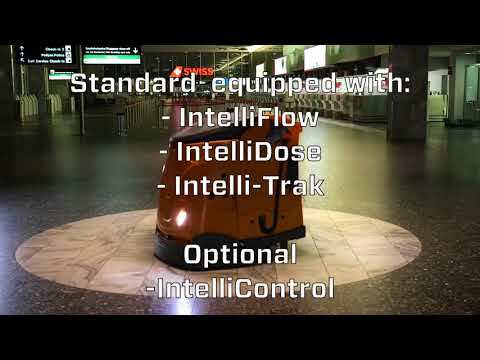 Management of the cleaning robot : With IntelliTrak the performance of the machine is measured and reported. Moreover, this enables the machine to inform a user that a program has been successfully completed or that for example a corridor is blocked.